images. The existing house is actually the one on the right. An unpublicized project came before Hudson's Historic Preservation Commission last Friday morning. The owner of a house at 76 North Fifth Street, Fenton Forsdick, gave a rambling, heavily accented presentation that left commissioners confused and agitated. Near as they could tell, the petitioner wanted the commission's blessing to remove a window from his front facade. This would allow him to create a walk-in closet behind the newly blank wall; presumably, as is the case for many houses of the era, existing storage space is inadequate. The HPC quickly and unanimously voted down the petition, and vented its considerable indignation. "Our heritage is at stake," sniffed one commissioner, summarizing the views of her peers. "This is an historic facade. To disrupt the three-rank rhythm would present a threat to the very foundation of our society." "The mere suggestion of altering this facade in this manner has made me queasy," said another commissioner. "Although it could be the German breakfast quesadilla I had at Bob's," he added before excusing himself from the proceedings. A tumultuous, forty-five minute argument ensued between the remaining commissioners and the petitioner. It quieted down only upon the petitioner's realization that he had inadvertently reversed his existing and proposed images. 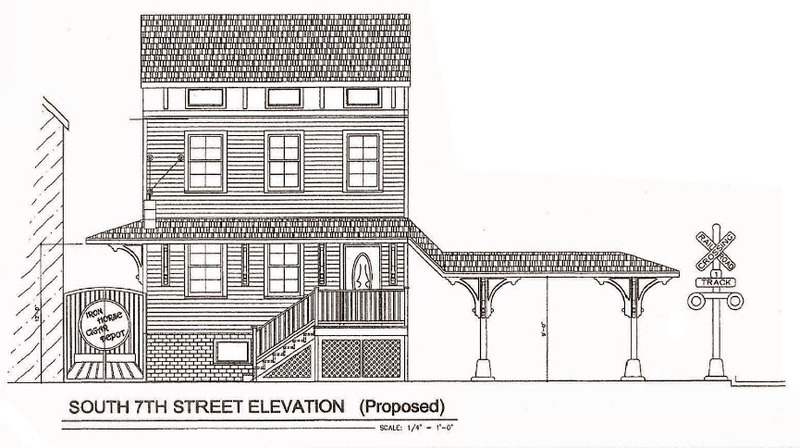 The picture he had labeled "existing" was in fact the "proposed" version of the house, and vice versa. Mr. Forsdick apologized sheepishly and profusely to the panel. What he really wanted, he explained in halting English to a now silent audience, was to install a new window above his front porch where there currently is a blank wall, in order to create a more balanced facade and introduce natural light into his dressing room. With the new information in hand, the Commission voted a second time against the petition. "This is an historic facade," explained a commissioner. "To disrupt it would threaten the very foundation of our society." "Our heritage is at stake," reminded a second commission member. The missing HPC member returned to the room in a state of visceral upset. "I have read that this kind of thing can lead to the mutilation of babies," he added. A mild but distinct scent, similar to that of a fresh lilac bloom onto which a domestic shorthair has dropped a major dookie, wafted through the chamber, and the meeting was adjourned. These and several other childhood mementos from the late 70s to early 80s were found behind a cupboard in a house on Union Street in Hudson. Perhaps someone out there knows the man and woman these two have since become. pedestrian, car, and rail zones are poorly defined. For a variety of reasons, most of them familiar to Hudsonians, it is difficult to agree on the boundaries of discussion regarding the Seventh Street Park. Hopefully, a discussion of the park's literal boundaries—its curbs—will prove less controversial. The park's western corner is a good place to start. My informal but repeated observations indicate that this is the busiest corner of the park and the entry point for the majority of park users. Unfortunately, the rail line that infamously crosses the park slices through this corner, smearing the distinctions between the pedestrian, motor vehicle, and rail realms. 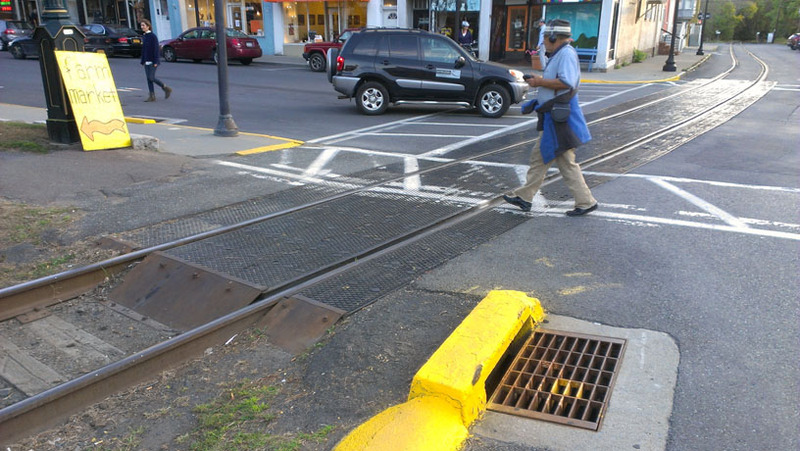 The sidewalk and curb dissolve into asphalt which dissolves into the rail right-of-way which dissolves into active lanes of traffic; where is one to safely stand while waiting to cross the street? There are no barriers to guarantee refuge, and the physical and psychological assault comes from more directions than can be confidently monitored. 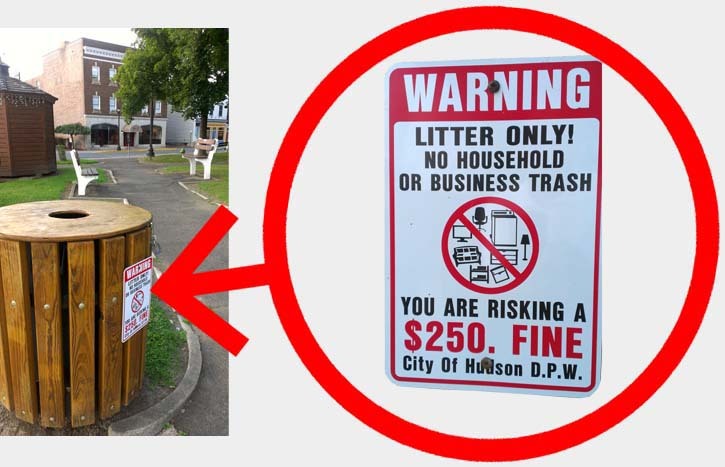 The situation is only slightly better for those approaching the corner from the other side of the street, where the awkward boundaries combine with other poor physical cues to present a picture that on good days is ambiguous, and more often is repellent. From there, it is worth seeing if the rest of the park's perimeter would benefit from similar attention. The easier we can make it for people to cross the street to the park, the more users the park will have. And indeed, when deployed on both sides of an intersection, curb bumpouts can reduce pedestrian crossing distance by as much as fifty percent. They have many other advantages compared to straight-curbed intersections: they allow roadway signs to be placed closer to drivers' center of vision. When used as planting beds, they reduce surface water runoff into the roadway. And they have a generally positive effect on parking: they don't steal spaces because their locations already are no-parking zones, and they make it more difficult for scofflaws to park too close to an intersection. Perhaps most importantly, curb bumpouts alter the image of vehicle-heavy streets by advertising the right of pedestrians to inhabit intersections. Their one significant shortcoming is that they can complicate snow removal. This is less of a problem today than it was twenty years ago, however, as many municipalities now invest in smaller, more agile snow removal equipment. As I looked into all of this, the question arose as to whether any of the streets bordering the park can be narrowed in their entirety. All the streets are now two-way; and I've never been convinced this is needed on Seventh Street and Park Place, which run along the long sides of the park. Whenever I drive on one of these streets, I find myself wondering if I should be driving on the other one. GIF animation may not work in some mobile browsers. The diagram at right shows a suggested pattern with one way traffic on the two long sides of the park. I don't make this suggestion lightly, as I usually am averse to converting two-way urban streets into one-way streets. Twentieth century planners frequently did this to expedite vehicle flow without regard for pedestrian experience. But on the two streets in question here, there is little chance of vehicles gaining prominence. We'd be creating narrower, one-lane, one-way streets that are quite short, and we'd grant any leftover real estate to pedestrians. You might notice that I've continued the one-way traffic on Seventh Street into the next block heading southwest (lower left in diagram). At present, this block is ridiculously, if pleasantly, complex: the street is narrow, there's a train running down one side of it, there's pull-in parking on the other side, and there's two-way traffic. There might be a reason for this last aspect that I cannot surmise, but my working assumption is that a one-way accommodation will be adequate because Sixth Street already flows in the opposite direction. Ultimately, this is a question on which to consult the traffic engineers. Putting all this together, I've suggested below some possible changes to the curb boundaries of the park. The sidewalks are wider and the crosswalks to the park are shorter than at present. Parking has been maintained around the entire perimeter. The biggest license I took was in showing pull-in angle parking on Park Place; I'm not sure there is enough space. If the irregular curb geometries look odd to your eye, it likely is due to the abstract nature of the drawing. In the real world, you've almost certainly encountered similar curb shapes many times without such concerns arising. For now, I've represented the park with an expanse of green. This does not indicate a design intent but the absence of one. I'll continue my sporadic investigations into what might happen inside the park's boundaries another time. I came across this handsome, well-worn van while having breakfast in Saugerties, New York, an urban village twenty miles south of Hudson. It sat in the driveway of a Victorian house with a similar patina of neglect. I imagined it to be an artifact of a defunct family business, perhaps a baker or drycleaner in the village. But the blue and gold license plates suggested it recently had been, and perhaps still is, roadworthy, missing turn indicators notwithstanding. The van lacked badging, and I'm not good at sight-identifying cars built before about 1950 or trucks of any era. When I returned to my office, I Googled "step van." 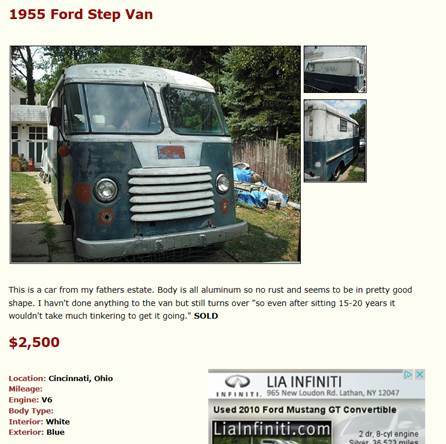 The first page of images included an advertisement for a 1955 Ford Step Van. It was this very vehicle, for sale last year in Cincinnati. An intrepid soul apparently drove it 750 miles to its current resting spot. I wouldn't be comfortable driving it a tenth that distance, but it does look like it would make a very cool and serviceable urban food truck. two-block section of roadway prevents a simpler, straighter route (dashed line). Below, the existing intersection of Warren Street with Worth and Prospect. In a recent post, I looked into rerouting U.S. Route 9 as a way of reducing truck traffic within the Hudson street grid. I raised the possibility of simplifying the route by widening a narrow, two-block stretch of Prospect and Fairview Avenues, and as an additional option, merging Prospect and Fairview into a continuous street. 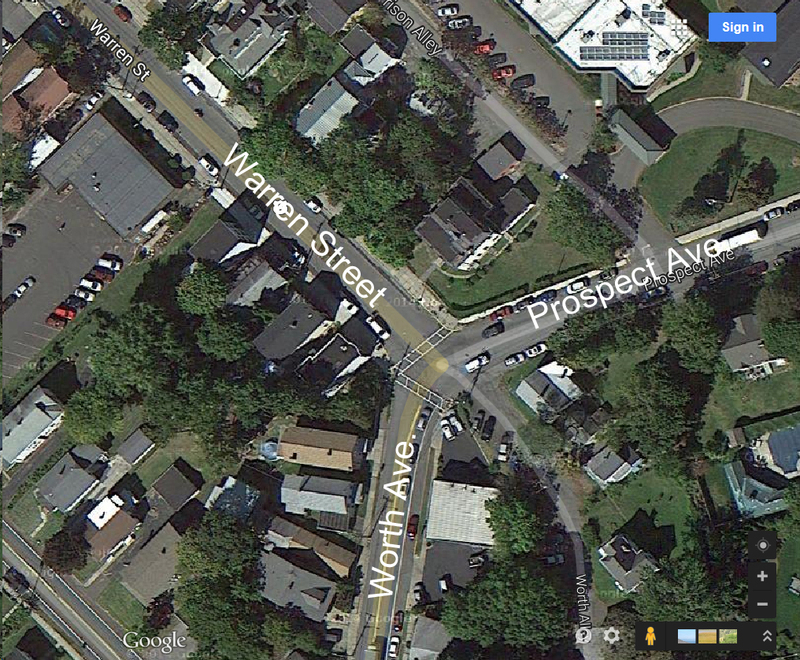 In this post I'll look at the intersection where my rerouting began, the meeting of Warren Street with Prospect Avenue and Worth Avenue. Some Hudsonians complain about this intersection because of the three-way stop signs. Personally, I find communal value in the eye contact and informal coordination they call for, but at rush hour, when I almost never drive, such charms are perhaps lost. Whether or not the intersection is a failure from a traffic standpoint, it is most definitely a failure from a civic standpoint. This is an important intersection in Hudson. It marks the head of Warren Street, the cultural and commercial spine of the city, a street celebrated for its architecture, restaurants, and galleries. But while the bottom end of Warren Street is anchored by a promontory overlooking the Hudson River, here there is no indication of the street's significance. There is no major building or space to complete the street axis and pull walkers to its top end; the strongest architectural gestures are an auto repair garage and a marginally maintained, 1870-ish flop house. Besides presenting a significant aesthetic problem, this represents an economic and cultural problem, as properties at this end of Warren Street have tended to languish. significant marker at its upper end. Below I offer a suggestion for anchoring the top of Warren Street. I've realigned Prospect and Worth Avenues into a continuous street, and extended Warren to meet them in a T. I also rerouted the alley behind Worth Avenue to connect with Prison Alley. 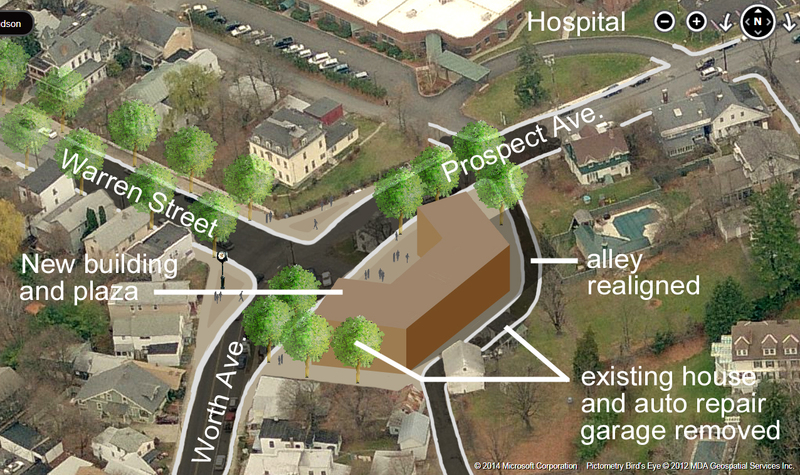 These changes would result in the loss of two houses (one architecturally undistinguished) and the auto repair garage. The gain is a clear beginning/end to Hudson's main street and a large, developable parcel to the southeast. A street realignment and new building and plaza offer a civic gesture at the head of Warren Street. On the new site I've suggested a large building and plaza to preside over Warren Street. The location lends itself to a public building such as county offices, a police station, or a library. Unfortunately, these functions are all in the process of being relocated to other sites in Hudson. A church, grand hotel, or apartment building might work, and the proximity of the hospital suggests an administration building. However, some of these uses might not lend the right civic note. But it's fun to imagine something new and impactful at this location. A good street should have a good beginning. And a good end. Twice a month, every month. This is why your insurance premiums are too high. It's too bad the current example is so pedestrian, but kudos to the Historic Development Commission of Raleigh, North Carolina for having a policy that officially recognizes contemporary architecture as part of the historical continuum, and that allows modern architecture within historic districts. Raleigh HDC guidelines state: "The introduction of a compatible but contemporary new construction project can add depth and contribute interest to the district." The full story may be found at Architect magazine. Last month, the Register-Star reported that the Hudson Common Council has been asked to explore the transfer of a 33-acre parcel from the school district to the city. The city would in turn sell the unused parcel, located behind Hudson High School, for private development. This would generate revenues for the city through the sale as well as through future tax revenues. Fiscally speaking, this seems like an excellent idea. Unfortunately, it is an inducement to create sprawl. The site is located far from existing physical and social infrastructure, most notably the Hudson grid. Presumably it would receive residential development, but anything built on the site will be automobile dependent. A 33-acre parcel behind Hudson High School may be made available for private development. Not far away, in Hudson's North Bay, the Columbia Land Conservancy has been pursuing a plan to create a conservation area. It would touch the Hudson street grid on the south and connect to the existing Greenport Conservation Area on the north. Question 1: Is there any land that the Conservancy has included in its plan that is a.) adjacent to the street grid, and b.) buildable? The answer would seem to be "mostly no," as much of the land in the vicinity is swampy, steeply sloped, toxic, and unstable. But to the extent the answer is "yes," I pose Question 2: Can we rethink things a bit, such that the school district parcel becomes part of the conservation area and any buildable land near the city grid gets built on instead? In Part 2, I'll look at an ambitious possibility for growing Hudson on an urban, rather than suburban, model. Columbia County Courthouse, Hudson, New York. Photo by Sorche Fairbank. There are more things wrong with this proposal than I can speak to; Carole Osterink already has addressed many of them. But I will attempt to make cheesecake out of cheese by addressing one big problem: The proposed roof canopy steps down awkwardly, and it has a meaningless, unused space beneath its lower portion. Below I've suggested building a raised platform at the same height as the existing front stoop. This would allow the roof canopy to extend horizontally, more clearly evoking the desired imagery of a train platform. The raised porch would do a better job of concealing the parking behind it, and its users—I imagine the space serving as a smoking porch—would be at platform level relative to the passing trains. If only the fitness center were still across the street, we could all enjoy the theater of the smokers and the treadmillers huffing and puffing in unison. With all that said and drawn, I don't think either proposal is legal, as the roof appears to extend over the public sidewalk. If so, surely someone will notice this before a building permit is granted... um, right? UPDATE, 10:50AM: I took a look at the property on Bing, and the existing house appears to sit back from the sidewalk a couple feet relative to its neighbors. So perhaps the roof does not violate the zoning setback after all. The Register-Star has an article this morning on the computer game, The Sims 3. Among the buildings into which one may imagine his life is Olana, the home of Frederic Edwin Church in Greenport. I was tempted at first to trash the dorky architectural execution, but found it hard to not be charmed by it. Last weekend we headed upstate to visit family and friends. We paid a visit to our friend Peter, an organic farmer with a fondness for experimentation. He showed us some crops we had never heard of and a few we had heard of but had never seen up close, such as flax. Peter doesn't farm any animals, but he keeps some interesting beasts around. His pet buffalo Annie is very shy. She came out of the barn only with some gentle nudging from Peter. Annie is about two-thirds the size she should be due to an infection in her youth. A large buffalo weighs twice the average horse, but Annie is about the same size as her friend Crowbait, a smaller than average equine. The angle of this picture makes Annie look smaller still. A barn on the farm dated to 1810. My phone battery died, so the only pictures I got were of the interior. One of the original hand-hewn beams is visible at the very top of the photos below. The lighter colored beam was installed more recently to support a loft. A friend of Peter's did the carvings. From left to right are Crowbait the horse, an unidentified chicken, Annie the buffalo, and my favorite, Chester the raccoon. Peter raised Chester after finding him last year as a orphaned baby. He became the family pet and took to following Peter around the farm. When Peter performs repairs at his workbench, Chester picks up whatever tools are nearby and mimics his activities. Recently, Chester went AWOL. After several days, he showed up at the barn looking surprisingly healthy. He had gained a few pounds and his coat was luxuriant. However, he was acting oddly, which led Peter to suspect he had been poisoned. Peter forced a charcoal pill down his throat to absorb any toxins. Then Chester bit Peter—hard. Peter rushed Chester to a veterinarian, who sensed that something else was amiss. A look under the hood revealed that Peter had medicated a wild female raccoon. Sadly, "Chesterina" did not recover from whatever was ailing her, but we're happy to report that Chester has found a new girlfriend, "Chesterella," and Peter is doing well following his rabies shot. Before returning to home base we swung through Wolcott, New York to get a look at the Venus statue in the town center. It is reported to be a twin to Hudson's Venus, which has been in storage, long hidden from the public eye. Fortunately, my camera came to life for one last shot. Unfortunately, the Wolcott Venus was a little disappointing up close. Here's hoping Hudson got the better looking sister. 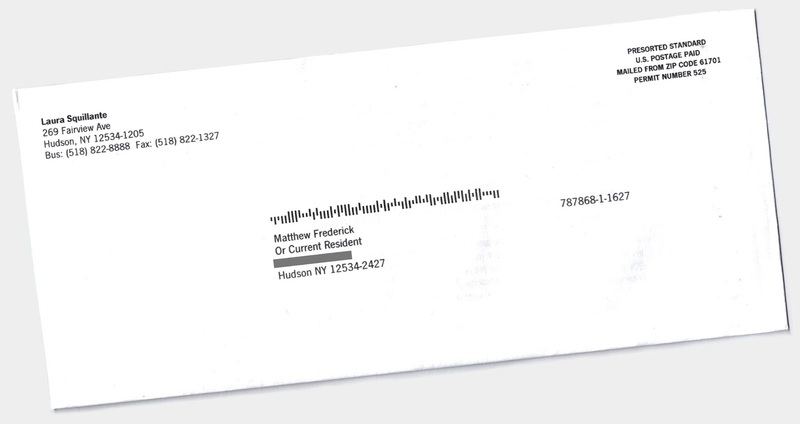 I wrote the following essay on Hudson for Architect magazine in September 2009. At the time, I didn't realize the extent to which those living on Hudson's economic fringes reside north of Warren Street. I also missed on my population estimate. The larger lesson of the essay holds. Also, space limitations prevented me from expounding on ways to close America's economic disparity. My approach to urban economic development is described in modest detail HERE. Firefighters parade through Hudson, N.Y. I love big cities, but I often find small cities more compelling. The dispiriting and encouraging aspects of urbanism are more immediately juxtaposed, often heart-rendingly so, but the disparity between them seems bridgeable. Surely, this place can be made to work, if only. Hudson, N.Y., a settlement of 8,000 residents two hours north of Manhattan, is a two-square-mile snapshot of America’s urban disparity. Its main avenue, Warren Street, is a stunner; it looks as if eight very charming blocks of Brooklyn left the big city a century ago and moved to Columbia County. It has its rough spots, but Warren Street has been experiencing a revival, thanks to gentrification, historic preservation, an influx of antique dealers and tourists, and the helping hand of government. In the blocks immediately to either side of Warren Street, one finds the other Hudson: comparatively poor, nonwhite, disconnected, and underemployed. The crime rate is higher, and the rough spots in the urban fabric are rougher. The industrial base is nearly gone, as are innumerable mom-and-pop shoe stores, food marts, and repair services that once made Hudson, Hudson. Thanks to Tom DiPietro of WGXC Radio for graciously hosting me on "We the People" this past Thursday. We talked about plans for the Seventh Street Park, the politics of sharing a bench, what might happen if Hudson had 50,000 people, and more. The full program can be heard via the audio player below or on the WGXC website by clicking here. The view from the park to the northeast/east is unwelcoming. 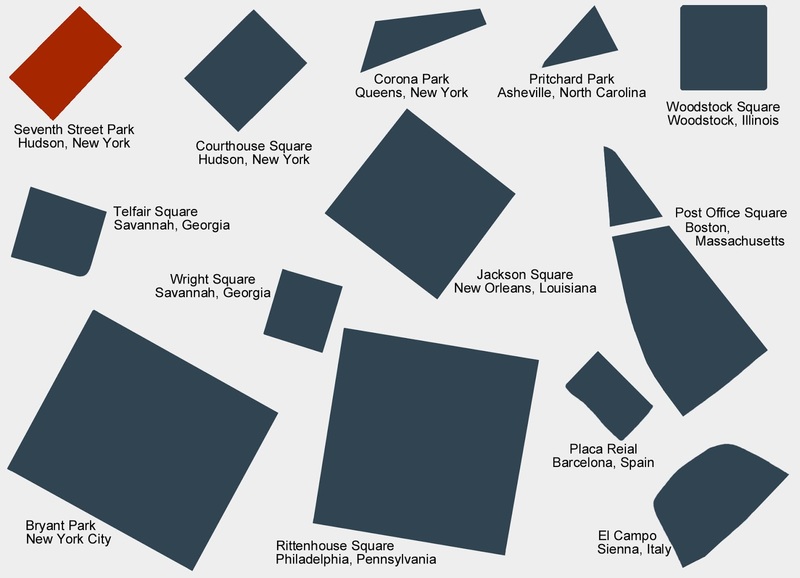 Urban spaces succeed through their relationship with their context. If a public space is of a type that is to be activated by workaday activities, it usually needs to be fronted by a well-defined street wall. Strong built edges generate life in a park, define it as a meaningful place, and provide a sense of "hereness." Hudson's Seventh Street Park is defined reasonably well on most of its perimeter, where two and three story buildings directly front the sidewalk. But the northeastern/eastern side/corner is "spatially leaky." A homely, one-story Citgo station sits sixty or more feet from the public way. A train right-of-way immediately west of the Citgo station and some odd building and street geometries to the east contribute to additional spatial weakness. A park user walking toward this corner is presented with a destination that ranges from unclear to unpleasant. walls, but on the northeast and east it is spatially leaky. 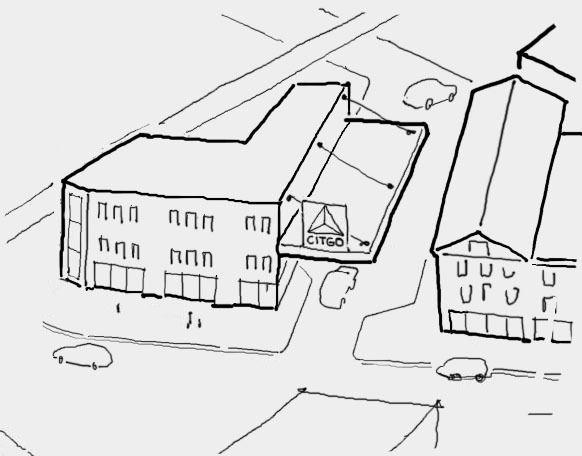 Of the several offenders, the Citgo station receives the most frequent criticism. I hear occasional, hopeful musings that economic pressures from increasing real estate values will cause it to eventually go away. I think this is unlikely. It is difficult to get rid of gas stations under almost any economic circumstance, because they earn more than almost any other use. If we are going to address the problems at this end of the park, I think it would be wiser to seek an urbanistically friendlier design for the gas station site that maintains Citgo as a tenant. If nothing else, the exercise is good practice, design-wise and emotion-wise, for learning to work with undesirable constraints. 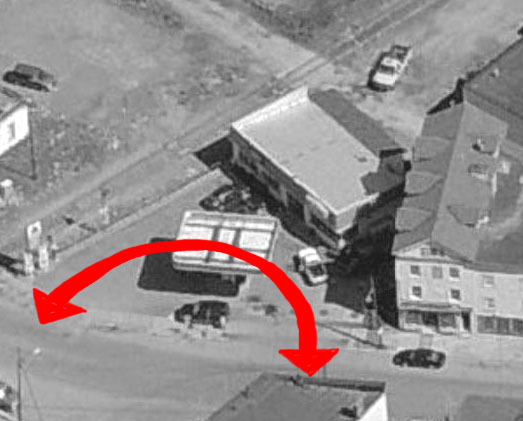 At present, vehicles enter and exit the Citgo site on the same side, i.e., Columbia Street (below left). This design decision, made long ago, required that the building be sited on the back of the site. 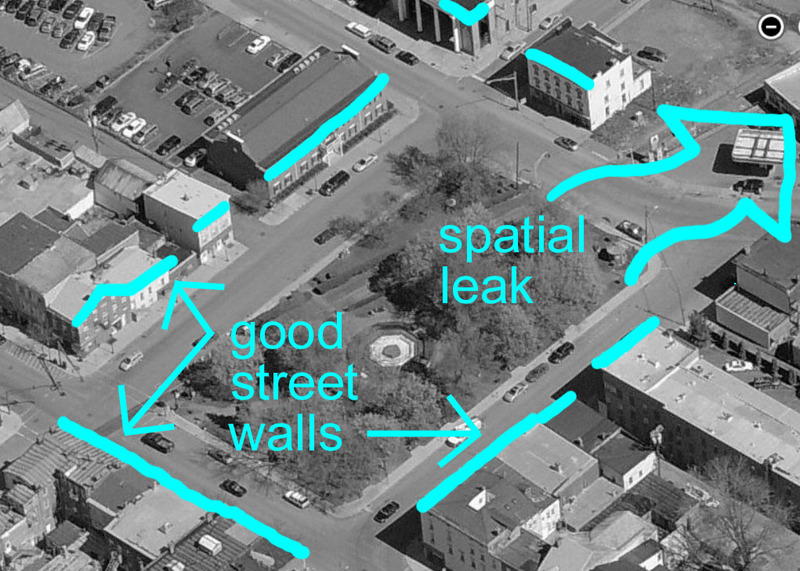 A more sympathetic building placement can be achieved by employing a drive-through circulation pattern, from Columbia Street to the alley (below right). This would allow the placement of a building on the Columbia Street edge, where a building stood years ago. Ideally, a new building here would be three stories high (the former building was two stories) and would house ground floor retail (including the gas station mini-mart) and other uses that would activate the sidewalk and park edge. This would solve part of the problem, but the railroad right-of-way to the west (i.e., left) of the gas station would remain spatially leaky. At bottom, I've illustrated one way of strengthening the street wall here. I offer no warranties on the quality of any of the architecture represented, although I suspect some will find the beer garden compelling. In a perfect world, we wouldn't need to concern ourselves with oddities such as a gas station and a railroad on our town square. If we were facing the decision today for the first time, would any of us, other than Citgo and ADM, choose to have them here? And yet many Hudsonians, even some staunch formalists, admit to liking the intrusion of the railroad. It is part of who we are, part of what the park is, part of what makes Hudson different from other places. Indeed, the things that by some measures don't belong in a city are the very things that make it authentic and interesting. Granted, it may be easier to romanticize a railroad line than a Citgo sign. But before declaring that a conclusion, we probably should check in on the question with the Red Sox fans among us...perhaps even some Yankees fans. Some possibilities for strengthening the street wall at the northeastern side of Hudson's Seventh Street Park. Hudson has much of the complexity of a larger city, but its small size makes one continually aware of the whole. When looking at a small part of it, one almost unavoidably becomes aware of the other systems and the whole with which it interacts. This interaction of parts with systems, of details with whole, is a big part of what makes urban design compelling to me. It was in this vein that, while looking at the potential redesign of Hudson's Seventh Street Park, I became distracted by the presence of U.S. Route 9 running along its southeast side. As one of the official truck routes through Hudson, it brings heavy traffic into the heart of the city. Reducing this traffic would go a long way toward improving pedestrian experience. U.S. Route 9 takes an odd jughandle at Hudson. Route 9 enters the Hudson street grid due to an abrupt jughandle in the route's more general path. A more natural course lies a couple blocks to the east; why doesn't Route 9 follow it? Are there physical factors preventing this, and can they be successfully mitigated to the benefit of park users? The bird's eye view below allows a closer look at the route's circuitousness. Drivers traveling northward on Route 9/Worth Avenue must turn left onto Warren Street, right onto Park Place, right onto Columbia Street, left onto Green Street, and finally left onto Fairview Avenue. A shorter and simpler route would involve a soft right onto Prospect Avenue, which leads almost directly to Fairview Avenue and points north. Your GPS knows this: ask it to get you from a point south of Hudson to a point north of it, and it will skip the jughandle and have you follow the dashed line. The reason trucks do not have this option apparently lies in a two-block stretch between the end of Prospect Avenue and the head of Green Street. The roadway here is particularly narrow, with parking on both sides and residences sited close to the sidewalk. There is barely enough space for passenger cars, and widening the street for trucks would be disruptive to a number of residents and property owners. I'm not eager to demolish houses, whether or not of historic value, but from my armchair blogger perspective the possibility is worth a look. 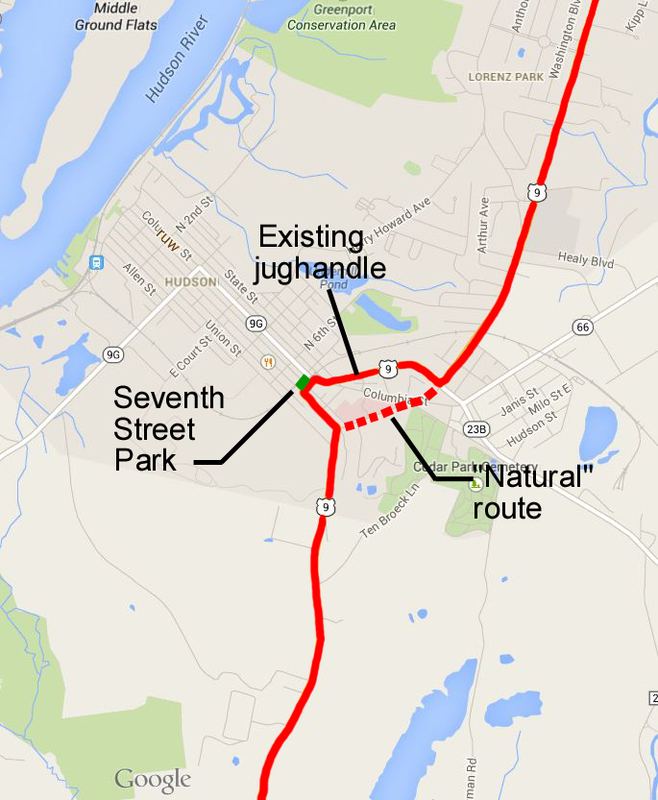 road capacity and forces U.S. Route 9 to follow a complicated jughandle through the heart of Hudson. The street widening I look into below began with a revision I suggested several weeks ago to the end of Prospect Avenue, where it meets Columbia Street and Columbia Turnpike. At the time, I proposed simplifying the complicated street geometries into a more conventional four-way intersection. 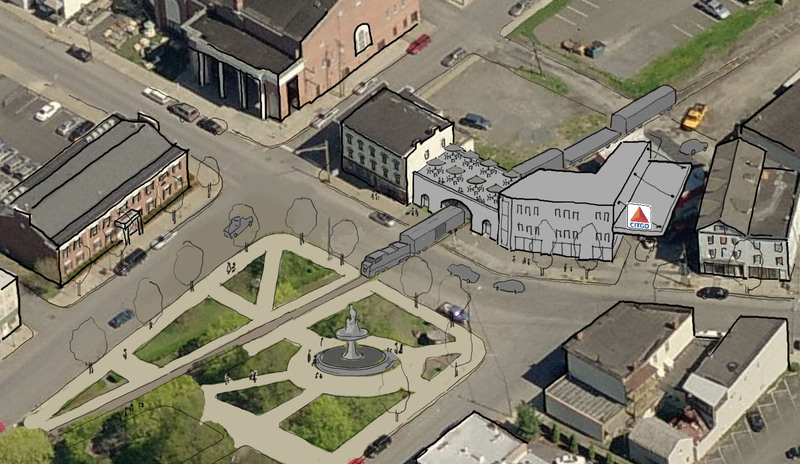 I also introduced a public garden in a triangular space that resulted from the closure of a portion of Columbia Street. These suggestions are shown in the images below. With that as my starting point, I've widened one block of Columbia Street and one block of Fairview Avenue. Assuming street parking is maintained (desirable for the residents' convenience, as well as for the safety of sidewalk pedestrians), this would necessitate the removal of at least three residential buildings on the north side of Columbia Street. relocated to a shorter, more natural path. However, several buildings on the north side of Columbia Street would be lost. Going a step farther, Prospect Avenue could be merged directly into Fairview Avenue, making the two streets into one continuous street (below) and eliminating a left turn for northbound traffic. This would endanger the same three buildings as the preceding scheme. Street merging: Prospect Avenue and Fairview Avenue merged into a continuous street. Such concerns aside, the possibilities are appealing. Prospect and Fairview Avenues have an inherent scale and sensibility more conducive to handling trucks and through-traffic than the streets within the city grid. And if the hospital expands in the future (as seems likely), the merging of Prospect/Fairview could allow the creation of a more coherent streetscape in an area where street identity is currently muddled. A closer look at the other end of the jughandle, where the head of Warren Street meets Worth Avenue and Prospect Avenue, is in order. I'll save that detail, and the larger discussion it will lead into, for another time. This Thursday, September 4, I will be on Tom DePietro's radio program to discuss the potential redesign of Hudson's Seventh Street Park. I'll be making one or two more posts on the park before then. I hope you will join us. Tune in at 10AM to 90.7FM or listen online at www.wgxc.org.